And, now for the story behind my "Wordless Wednesday" shot -- brought to you by the fun gals who run "Tell Me Thursday!" 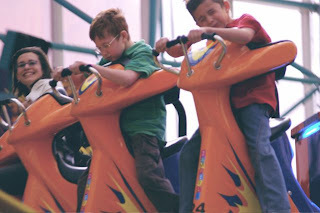 This is a shot of my 2 boys on a ride at Las Vegas' Circus Circus Adventuredome. They didn't see the ride run before they ran up the steps to climb on and I'm pretty sure they had NO idea that it spun around while sliding up and down a large ramp. They were holding on for dear life!! And, surprisingly enough, they didn't want to ride it again! LOL! If you had a Wordless Wednesday photo up, explain your picture today and link back to Tell Me Thursday! While you're there, check out their awesome contest for a new Flip HD video camera! One picture to save:) I can't do those rides anymore. I think having children you transfer that craziness to them. Are you doing a video too? Wow! I don't blame them for saying nuh uh- not again.